Howto: RHOSP5 install on RHEL7, with controller on VM, a native compute node for efficient virtualization and instances which can be accessed externally. This unofficial guide differs from other evaluation Single-Node Deployments in that it still uses one physical system, but gives you experience with a separate compute node and is a good next step as you learn more about Neutron. This document covers how to configure a RHEL7 system to use nova-compute for native virutalization while running other openstack services on a VM. In the end you will be able to boot instances that can be accessed over the same network as your RHEL7 system. If you normally run RHEL or Fedora on your laptop and boot VMs of different flavors for development or experiementation using virt-manager but want to switch to using OpenStack, then you might like the setup described in this document. This documentation is heavily network oriented and explains configurations made to the network in detail while mentioning installation of KVM for virtualization, the LVM allocation of block storage and the installation of OpenStack via packstack only in passing. I am assuming that you have already used KVM and LVM and have already done a packstack all-in-one install and are not seeing these things for the first time. Instead I assume you are reading this so that you can do more more with your own personal OpenStack; e.g. use external compute nodes or provide instances that can be accessed from outside of your internal network. Thus, I am focusing on the network since I find that to be the hard part of such a configuration. The idea for this setup came from the Red Hat CL210 class (http://www.redhat.com/training/courses/cl210) as a similar set up was used in class. I am starting with kirk.example.com, a vanilla RHEL7.0 minimally installed system which has 125G of free raw PV which I will later make available to OpenStack. I will assume you have a similar system and not cover installing RHEL7. We will pick up from the install with registering to get your Red Hat Enterprise Linux Open Stack Platform (RHEL-OSP) entitlements. Find a pool from available.txt containing OpenStack and set it to a variable POOL. There will be four phases to configuring the network. Each of the above four steps corresponds with the following diagram with an orange number. In my network kirk's IP is 172.16.2.5 and I am going to be configuring my VM and my openstack instances with floating IPs in the same 172.16.2.0/24 subnet so we can all communicate. The default install of RHEL7 configures the device enp0s25 with network manager. Disable Network Manager and backup ifcfg-enp0s25, which we will replace using the conventions of the document described above. Verify that "NM_CONTROLLED" isn't in /etc/sysconfig/network-scripts/*. Update ifcfg-eth0 to the following, reboot and verify it still works. Kirk consistently gets the same IP from my DHCP server through its MAC address so that's the only reason I'm not going to configure it as static. Restart networking with `systemctl restart network` and see it work. If you are using a static address, then replace BOOTPROTO=dhcp in br100 with entries for IPADDR, PREFIX, GATEWAY and DNS1. At present a packstack install of OSP5 on RHEL7 will configure not firewalld, but iptables. We can now think of eth0 on kirk (the physical machine) as a port in br100. We will create a VM in the next step whose virtual eth0 will also plug into this bridge. 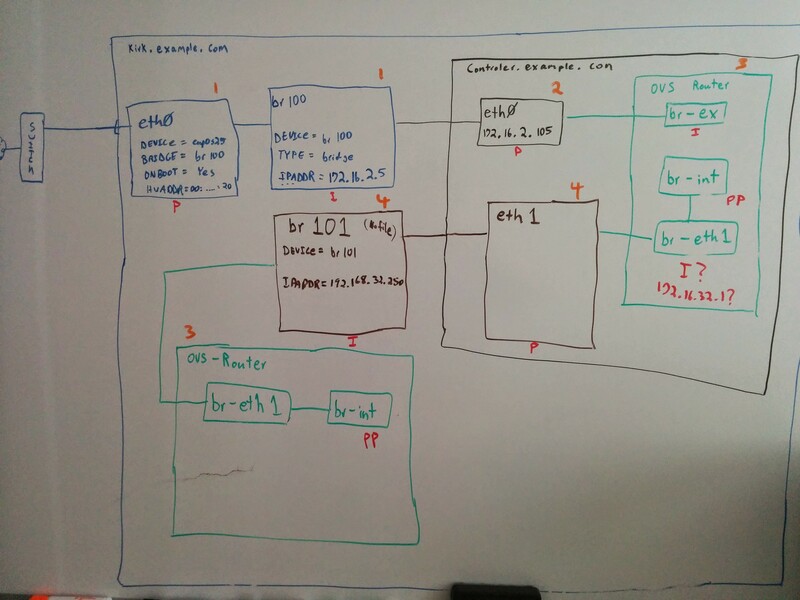 The VM will run our OpenStack controller and will use the same eth0 on the VM to reach br100. This connection will be our external network as far as OpenStack is concerned. The same VM will also have eth1 which will be used by OpenStack controller's internal network. eth1 will connect back to kirk via kirk's br101 which we will configure later. We will now install KVM so we can run a VM called controller which will have the hostname controller.example.com. Even though we'll be using kirk as our nova compute node later we have a chicken/egg problem to solve so we're going to use KVM directly to get our controller VM running first. The presumption is that any other VMs run on kirk will be controlled via OpenStack. Install KVM, verify the module and start/enable libvirtd. After a default KVM server install as described above, KVM sets up a virtual network that exists only between the KVM server and its VMs. The most basic VM installation examples in the KVM documentation demonstrate setting up a VM that will exist on this private network and will be NAT'd by the KVM host. The rest of this section explains how to set up the KVM host so that the VMs can exist on the same network as the KVM host as virtual servers without any NAT'ing. The private network uses a bridge called 'virbr0'. virsh can interface with this device directly. The default KVM network is defined in XML, as seen above, and the VM we will create will also be defined in XML. That XML will be modified to plug not into the default network bridge virbr0 but instead it will plug directly into br100. Note that virsh will list virtual devices so you won't see the non-virtual br100 but brctl will show both. The controller VM will use br100 as a network device but it will also need a disk. A raw pv of 125G is available and we will carve a 20G subset of it for the controller. Install a RHEL7 VM called controller. In my case I have a USB disk containing a RHEL7 ISO mounted in the location option in the command below. Note that I am specifying the raw LV I defined earlier and I am using the default network. Later we will set this to br100. Follow the text based installation. write your changes quit the default editor. Then start the VM and console into it. Next I'll start my VM and console into it. Reboot your VM and then verify that you can ssh to controller from outside of kirk; e.g. from your personal workstation. This will be important later when you need to access horizon. SSH to your VM and register it. Find a pool from available.txt and set it to a variable POOL. You should now have two RHEL7 systems that you are ready to install OpenStack on that can communicate using IPs on the same VLAN. We are now at the point where we will create Open vSwitch bridges and ports as seen in green and step 3 in the diagram. Many of these will be created by default via the packstack install, provided we direct packstack to do this. After that it's just a matter of plugging ports into the Open vSwitch bridges to get the full system working togther. The bridges below will exist by default after an OpenStack install. br-eth1 will be created during the packstack install because we will add the following directive to our answers.txt file. The first line above specifies that vlan (not local as used for an all-in-one install) will be how the compute and controller node communicate. OVS will then automatically create the 'int' and a 'phy' adapter to bridge things together from the physical to the integration bridge, and this is how traffic is shared amongst hosts. The physnet1 above is just a label used to map external networks and assign VLAN ranges. The trick, is that packstack will use the above to run `ovs-vsctl add-br br-eth1` on both systems. This command will create the bridge br-eth1 and later we will plug kirk's br101 port into the br-eth1 bridge as well as plug controller's eth1 port into the br-eth1 bridge. Hopefully the above explains where the components of the network in the diagram will come from. We will install packstack on the controller and then configure packstack to install OpenStack components on the controller as well as connect to kirk and install OpenStack components on kirk from the same packstack session running on the controller. To enable the controller to easily connect to kirk we'll generate an SSH keypair with `ssh-keygen` on controller. Packstack will later ssh-copy-id this key onto the controller. Next we'll install packstack and generate a default answers.txt file. In my network 172.16.2.1/24 is the IP range that the systems I do research on get from my DHCP server. A packstack install will configure a "public" network for you for a demo probject. I am setting the above since I want the demo project to have a floating IP range that will actually work. The default value, 172.24.4.224/28, has no meaning in my network. We are creating plenty of virtual networks but OpenStack's public network is where we make a connection outside of it so it should be a real address you can communicate with. In my case I want my instances to get a floating IP that can be seen outside of openstack which is in the same subnet as my other VMs like kirk and controller which are in the same network. You'll want to set this relative to your environment. Start the packstack install from the controller node and give it some time to complete; e.g. on my system it took about 40 minutes. You should see messages about puppet running on both the controller and kirk. When the install is finished point your browser at the controllers IP and read the /root/keystonerc_admin file for the admin username and password. If you're able to login to the controller then proceed. Now we'll connect the public networks by making the following changes in the controller VM's /etc/sysconfig/network-scripts/ directory. You should recognize this pattern from the work we did on kirk earlier. Note that there's no BRIDGE=br-ex because Open vSwitch will handle it. Note that ther's no Type=Bridge because Open vSwitch will handle it. Now we need to plug controller's eth0 port into the br-ex bridge and tell our VM in advance to restart the network immediately after this. You MUST do this in one line as you will be disconnected and hopefully reconnected by this command. This is slightly ad hoc as I overlooked it until now. If you do not create a VG called cinder-volumes, then packstack will create one for you with a loopback to the original install disk. I forgot about this and I'm going to allocate the space available on kirk to controller. I have 105G available on vgcontroller as I'm only using 20 of it for the controller LV. I'm going to make another LV and push it up to controller. The --persistent option updates /etc/libvirt/qemu/controller.xml so it will be there when the system is rebooted. I can see the new disk from the VM. Add it to the LVM pool. Removed "/dev/loop0" from volume group "cinder-volumes"
Now I have more space for cinder. The documentation above will have you create an instance. You should be able to see your instance running on your hypervisor right next to the controller. You just need to take care to let OpenStack manage your instances on KVM and only use virt-manager to manage your controller. The documentation above will also have you create a network and a router which your instance will attach to. Set the gateway of your router to the public network (172.16.2.0/24) and allocate a floating IP from this range. Then associate that floating IP with your instance. You should get an IP in the public range that you can use to SSH to your instance. Your instance should also be able to ping hosts on the Internet. The iptables command is done because of the way we're virtualizing our controller node. When the hypervisor reboots it may not forward traffic to the controller node and if you run an `iptalbes -L` and see that forward chain has the following, then you have this problem. After following the above, you should be able to reboot kirk, and then point a browser at your web interface to start using OpenStack.